Hudson Real Estate Monitor: Bankruptcy Laws Changed in 2005 - How can these changes effect your credit? 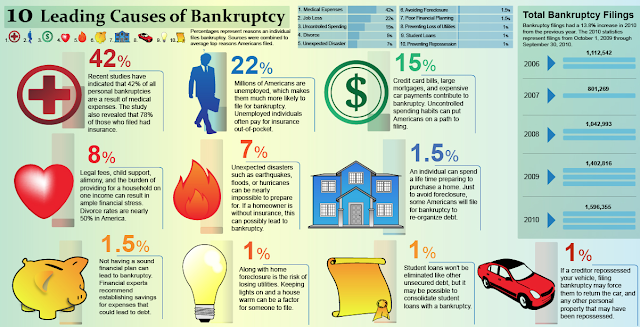 Bankruptcy Laws Changed in 2005 - How can these changes effect your credit? In 2005 the Bankruptcy Abuse Prevention and Consumer Protection Act, passed to filter out debtors who were supposedly exploiting the system by running up their lines and walking away even though this reason does not make the top 10 reasons why debtors claim bankruptcy. The legislation makes it much more difficult for debtors to claim bankruptcy. A debtor has to make an income that is less than median in order to file for Chapter 7. Above this income the debtor must prove that he can't afford to pay. Debtors have shifted from filing a full bankruptcy (Chapter 7) to filing Chapter 13 where debt is just reorganized. It means that debtors are not let off the hook but end up struggling over a longer period of time to pay off obligations. Chapter 7 is when the debt is expunged and the debtor is relieved from paying the debt off at all.